You can’t fix what you can’t find. Garnering customer feedback is more important than ever, and it’s exhilarating to see so many companies committing to surveying their customers post-purchase. 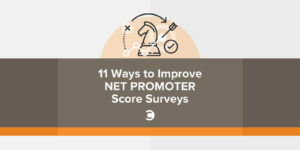 Many of these customer feedback collection mechanisms rely on the Net Promoter Score system, a simple zero to 10 scale that asks the customer how likely they are to recommend the business to a friend or colleague. Sometimes referred to as “The Ultimate Question,” NPS was originally created by Fred Reichheld and his team at Bain & Co, and is now the de facto customer experience satisfaction metric, used by businesses of all sizes and industries. You probably receive NPS surveys via email, as do I. In fact, I recently was sent two NPS queries in a 24-hour span, by two very different companies. Even though they are asking the exact same question, how they do so is quite different, which caused me to think about the best ways to craft such an appeal. 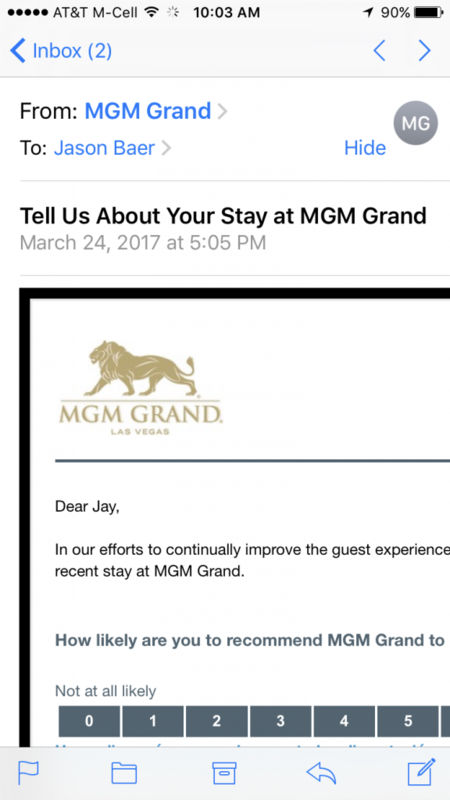 I recently visited the MGM Grand for a conference, and received this feedback request approximately 48 hours after checkout. I suspect Medallia has done subject line testing on these NPS emails, but I don’t personally love the subject line here, “Tell Us.” Feels like a command, and lacks warmth and empathy. Clear statement of the actual question. Ability to provide feedback in Spanish is a nice touch here, rarely seen. Humanize the organization by mentioned person in charge of feedback collection. I do not understand why this sea of logos is included here. We know MGM Grand is where I stayed. It is not relevant in this interaction (feedback collection) to remind me of all the properties in their portfolio, the name of their rewards program, etc. This is a waste of space, and robs attention from the matter at hand. I appreciate the inclusion of an opt-out mechanism in the footer of this email. The most egregious issue with this email is that is it not mobile-friendly. Here’s a screenshot of this survey via my iPhone, requiring a side-scroll to participate. The survey itself would be very easy to make work in mobile. The culprit on the spacing? The sea of logos! Certainly, this is an issue, as more and more customers are using mobile as their primary (or only) email access point. 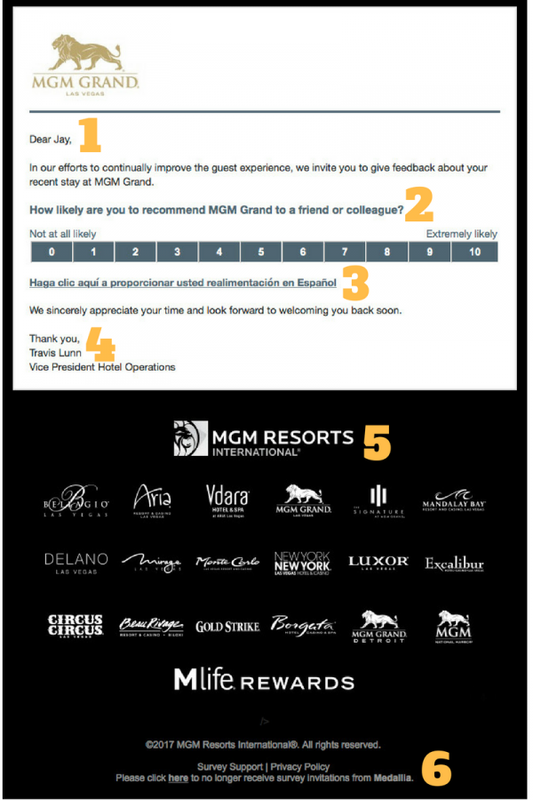 Also of interest is that the reminder email that MGM Grand sends out two days later to people who have not yet participated in the NPS survey has the same subject line (with the addition of “Reminder:”), very similar body copy, but a different and more compact footer. Still not mobile-friendly, so it appears that perhaps this is just an inconsistency with the email templates used for the initial NPS appeal, versus the reminder. In my assessment, it would be better if this email had a different look, different copy, and a different subject line. If they didn’t participate the first time, it’s probably not because they forgot and need a “reminder”—it’s because they didn’t want to do so. Taking an alternate approach to the request would be a better strategy here. ClusterTruck is a mobile restaurant and food delivery service with locations in Indianapolis, Bloomington, with several more cities on the way. 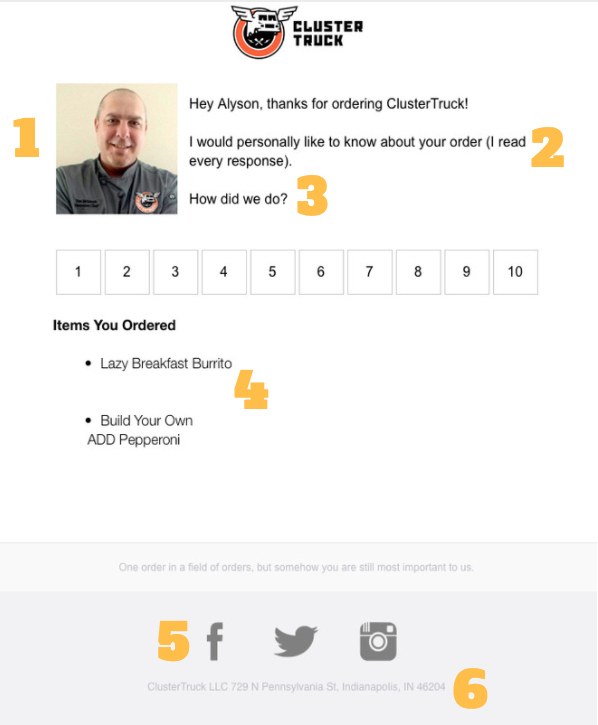 My wife received this NPS survey from Clustertruck the morning after food delivery. 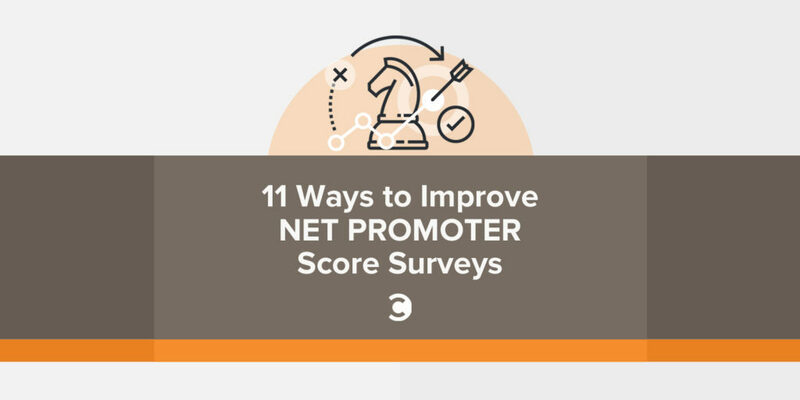 (Note: I am an investor in Clustertruck, but had nothing to do with this Net Promoter Score program, and had never seen it before this email). Subject: Alyson, how was your ClusterTruck? I love the personalization and humanity right up front on this one. The email is “from” the Chef, not the company. Terrific! Plus, using first name personalization in the subject line itself is a smart move that typically increases open rate. Outstanding addition to the personalization and humanization by using photo of the real Chef Tim (presumably). Excellent emphasis that this feedback is ACTUALLY READ by a real person. I do not like the vagueness of the query here. “How did we do?” followed by a NPS scale is not confusing necessarily, but is too imprecise. Terrific reminder of what items were ordered. While not particularly offensive, inclusion of social media logos in the footer is perhaps superfluous, especially without a request to follow on those platforms. No opt-out available, which is a problem, and perhaps a violation of CAN-SPAM regulations. The Clustertruck email renders perfectly on a mobile device. Upon clicking somewhere on the zero to 10 scale, both emails take you to a web page. 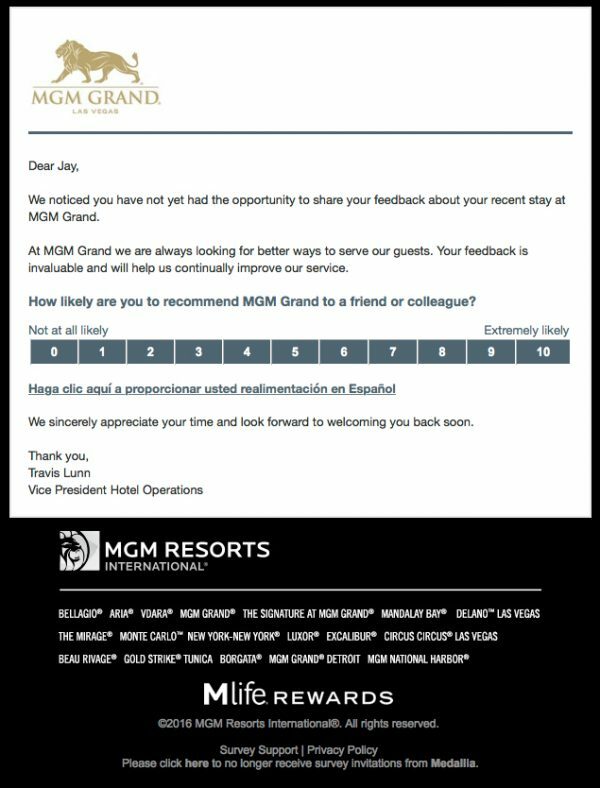 The MGM Net Promoter Score survey asks you for a reason why you gave the score you did, and then takes you to the front end of a VERY long survey that I criticized in my book Hug Your Haters, for being largely a marketing wolf in market research clothing. After picking a score on the ClusterTruck email, participants go to a web page where they are asked to provide commentary. After submitting some, they are asked to rate ClusterTruck on Facebook. The survey then concludes. Ask in your subject line; do not command. Personalize wherever possible, including the subject line. Humanize wherever possible, including in the “from” line. Also, add a photo of a company representative. Make clear that one or more real people will be reading these responses (if that is the case). Provide an easy way for customers to participate in other languages. Make the NPS survey email mobile-friendly. Remind customers what they ordered or purchased. Do not unnecessarily clutter the email with icons, logos, or other visual flotsam and jetsam. If you send a second email to non-participants, take a different approach. Make the post-click experience simple and straightforward.